Marten, a carnivorous animal of the weasel family, and genus mustela (Linn. ), which includes also the fisher and the sahle of Europe. The pine marten or American sahle (if. Americana, Turton) is smaller than the fisher, being about 17 in. from the tip of the nose to the base of the tail, the latter being 10 in. to the end of the hairs; it is also less common and considerably more valuable. The general color is a rusty yellow, with a lighter head, almost whitish throat, and dark tints on the back, varying according to season, latitude, and locality; the tail is cylindrical, bushy, and comparatively short; the inner fur is "ash-colored at the base, yellowish brown near the end, and in the best specimens tipped with dark brown or black; it is coarse and light-colored in summer and in low latitudes, but in the Hudson bay and Lake Superior districts the winter fur is fine, long, lustrous, and darker, the tail generally the darkest. It is shy, cunning, and very active, rarely approaching the haunts of man, preferring the dense pine woods of northern latitudes; it is carnivorous and pursues its prey into trees. It is generally taken in winter in dead-falls, set about a quarter of a mile apart and baited with a piece of meat or fish; the winter traveller in the mining region of Lake Superior, in following the Indian trails, sees many of these traps containing the dead and frozen victims. 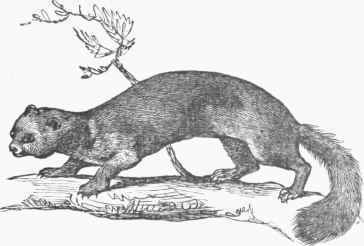 This marten is properly called the American sable, though the mink, of inferior value (of the genus putorivs, Guv. ), is by furriers erroneously called by this name; the fur is sometimes dyed and sold as Russian sable, when of very fine quality. (See Fur.) It has been questioned whether the pine marten of Europe (M. martes, Linn.) is the same as the American; it is probably a distinct species, and is so regarded by Prof. Baird. The northern limit in America, according to Richardson, is 65° N., where trees cease; the absence of trees, and consequently of the marten, according to Pennant, for 25 degrees of longitude on the Asiatic side of Behring s straits, is in favor of the non-identity of the two species; the same facts would add to the improbability of the true sable (M. zibellina, Linn.) beine found in this country; the southera limit, according to Audubon and Bachman, is about 40°, and its range extends from the-Atlantic to the Pacific. The European pine marten is grayish brown, with a yellow spot under the neck. The beech marten (M.foina, Linn.) has a white spot on the throat, the body more reddish and yellowish brown, the tail brownish black, and the downy fur of all parts of a lighter hue. The sable is described under its proper title. The martens have one more carnivorous tooth than the polecats, and are less sanguinary in their habits, eating when pressed more vegetable food; they are generally wild, inhabitants of woods, climbing trees in pursuit of birds, squirrels, and other sniall animals; they are all nocturnal, preferring cold and uninhabited regions; all are valuable for their fur, that of the sable being most prized, next that of the pine marten of America, then of the common and beech martens of Europe, and last of the American fisher. A German Publicist Geors Lriedridi Von, born in Hamburg, Feb. '22, 1756, died in Frankfort, Feb. 21, 1821. He studied at Gottingen, where he became in 1784 professor of jurisprudence, was ennobled in 1789, and was employed in various public capacities, serving during the five years previous to his death as Hanoverian minister at the German diet. His reputation rests on his Precis du droit des gens moderne de l'Europe (3d ed., Gottingen, 1821), and his Becueil de traites (7 vols., 1791-1801, and a supplement in 4 vols., 1802-8), the latter of which, with continuations by other writers, includes treaties of 93 years, from 1761 to 1854. He also wrote Cours diplomatique, ou tableau des relations exterieures des puissances de l'Europe (3 vols., Berlin, 1801), and several other kindred works. Karl Von, a German diplomatist, nephew of the preceding, born in Frankfort about 1790, died in Dresden, March 28, 1863. In the latter part of his life he represented the grand duke of Saxe-Weimar at the court of Saxony. His principal works are: Guide diplomatique (6th ed., 2 vols., Leipsic, 1866), originally entitled Manuel diplomatique (1821); Causes celebres du droit des gens (2d ed., 5 vols., 1868-'61); and, jointly with Cussy, Recueil manuel et pratique de traites (7 vols., 1846-'57).